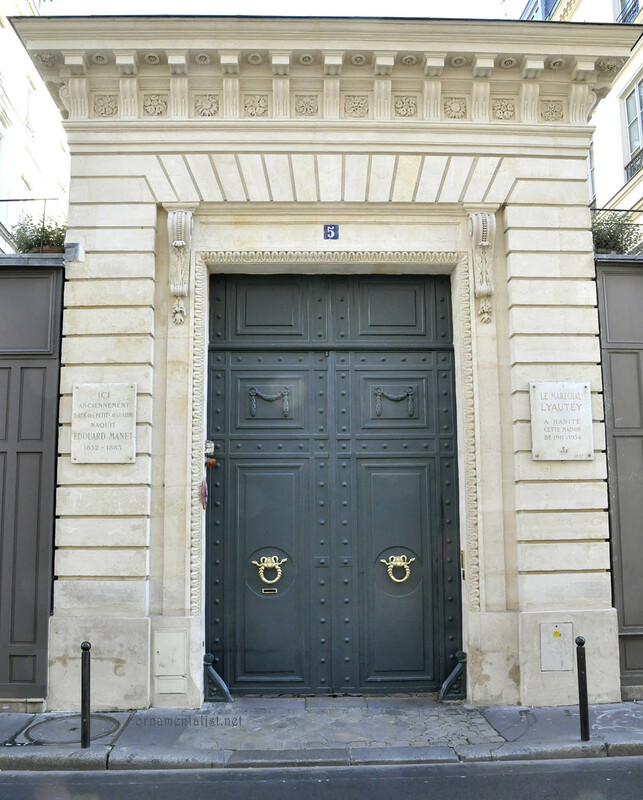 Last month I spent two fabulous weeks in Paris, staying in a very cool apartment in the chic Saint-Germain district. 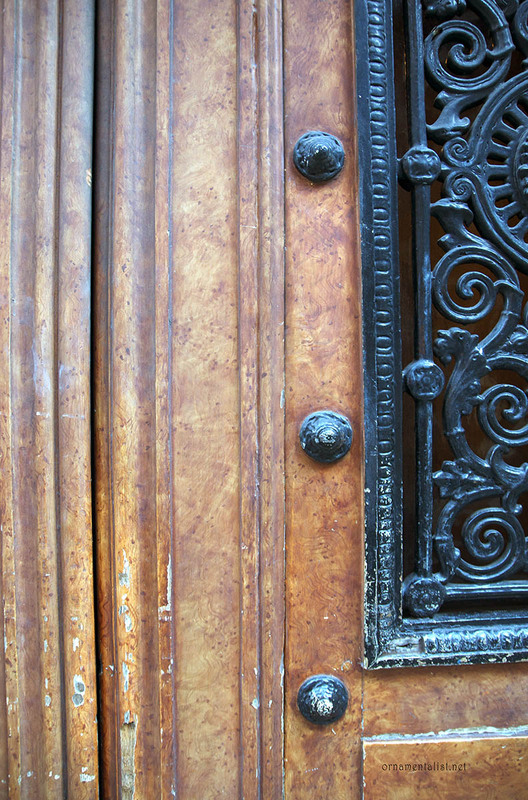 One day I wandered around just looking at the wonderful doors. You do that, too, right? Paris is a city of limestone, and the entry doors to these limestone facades are the only opportunity for color, so they often get special attention. Even a plain door is given a glossy, gorgeous treatment. Nearly half the doors are oak, although usually if you see an oak door, it's actually a faux finish imitating oak. Some of the painted oak is so realistic I had to look for signs of wear or peeling paint to be able to tell the difference. This charcoal grey is really popular right now. Blues, greens, and greys predominate in this neighborhood. Red appears to have fallen out of favor, perhaps because it fades so quickly. It seems every color you can think of looks great with limestone. Although there was one safety orange painted door of an art gallery that I really didn't like. I did not take a picture of it. With rare exception the doors are never polychromed. All woodwork in an entry or the paneling surrounding it is treated the same. I am not sure if this is by convention or law. 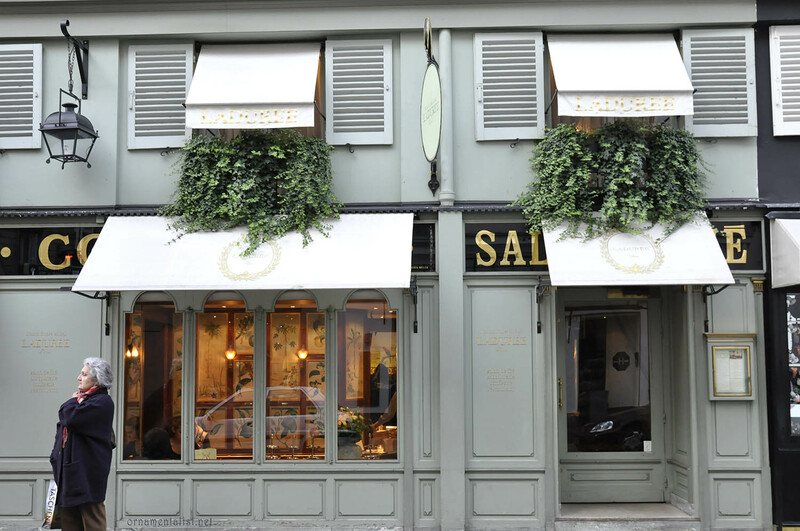 The gorgeous celadon paneling of the Ladurée shop. Madame was posing for my camera in front of the shop and at the last moment she turned to her good side and struck this casual pose. Brava. 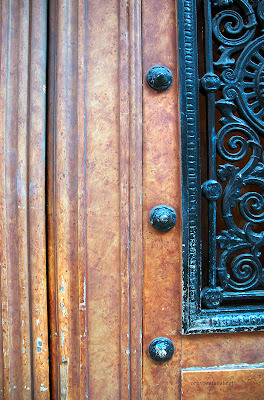 More of this collection are posted in my flickr set "Doors of Paris". all images in this post by Lynne Rutter, October 2011. My favorite neighborhood of Paris. I'll be in Paris for a week in only 3 weeks and I can't WAIT! 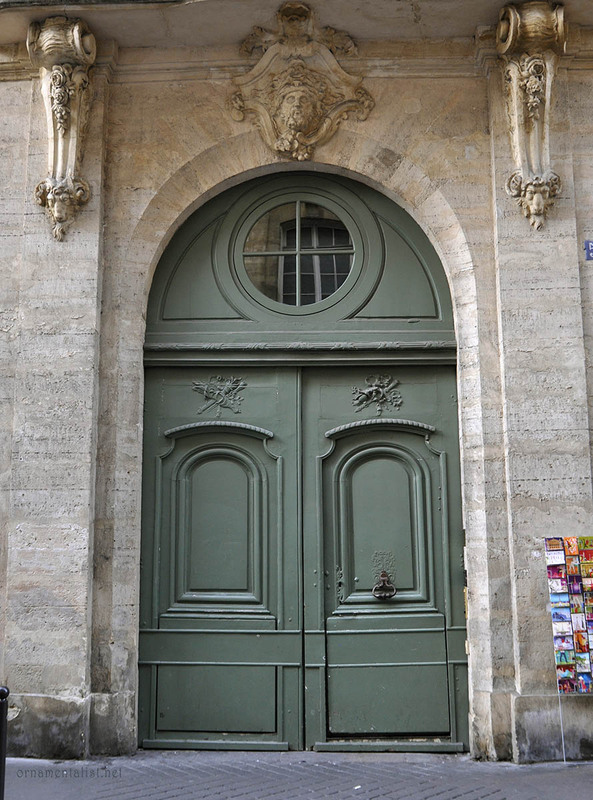 You're right -the doors are such a good counterpoint to the "french gray" city. 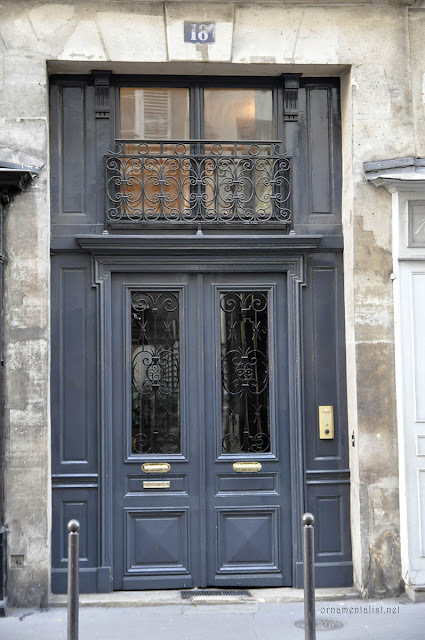 I believe that last shot -the Laduree in St Germain -was home to the shop of Madame Castaing, the well known interior designer back in the day? 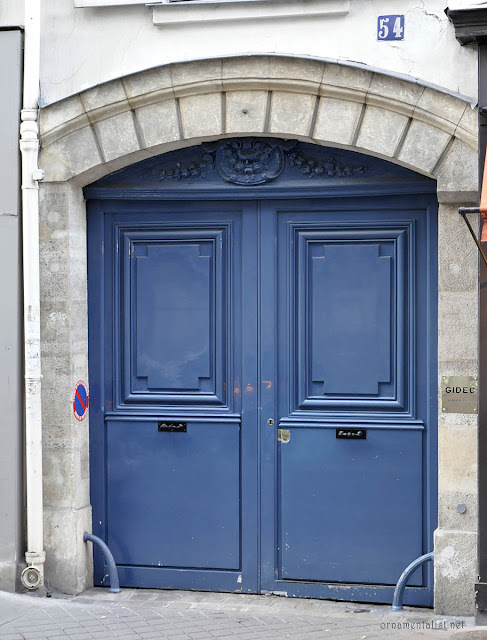 ok ArchitectDesign, your mission, should you choose to accept it: find me a polychrome door! let's see if the rule has an exception somewhere! Have a fabulous time! 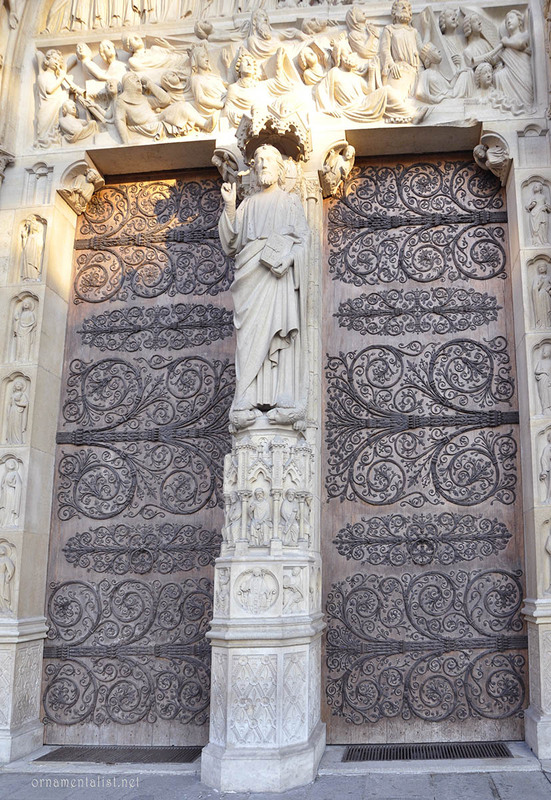 Hi, Lynne - I think all of these doors are beyond great ... but I do like the ones in color best of all. I'm repainting the outside of my house green, and I'm looking at swatches for a perfect plum. Doors for sure! Then I go up from there. I realistically need a person to defensively walk in front of me so I can photograph all that is beautiful in that city. 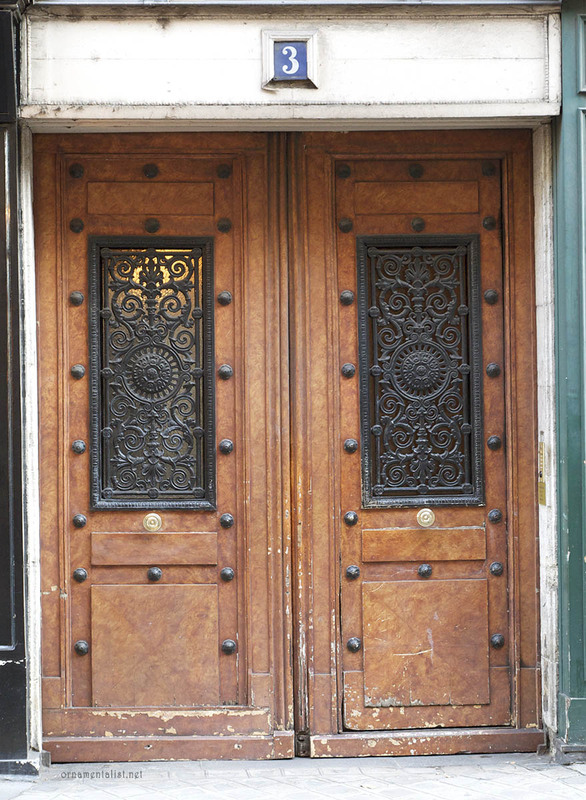 Amsterdam is also a great city for doors- their gloss is amazing. Hubbie tells me that the doors are painted lying flat and many, many coats are applied with lots of sanding. He was not allowed to paint the door- just his dad. 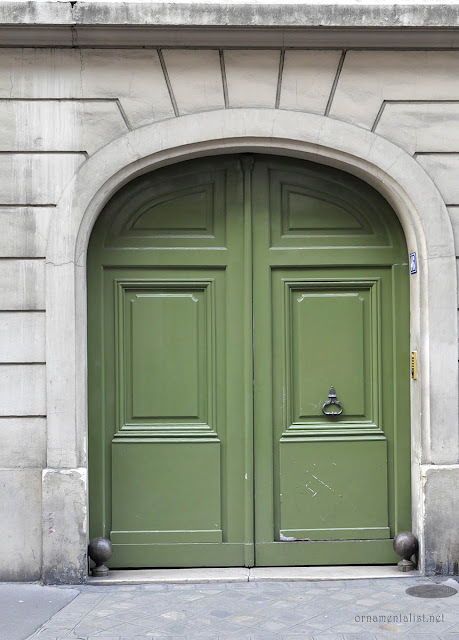 You can't have too many door photos from Paris! I really love the burl treatment, I have not seen that done. Merci Lynne! Thanks for the virtual trip! 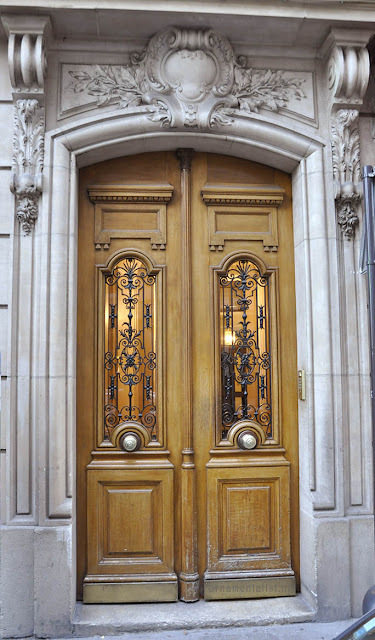 I too love the doors of France! My oldest daughter once said to me, "Mom, could you look any more like a tourist!? Stopping to photograph every door you pass?!" They're all so amazing and this burl one you captured is especially gorgeous. And I Loved Madame's last minute change up. Hilarious! Doors! Love them. I was living in Paris for quite a while before I realized that they were mostly faux-Bois. Incredible, and beautiful. 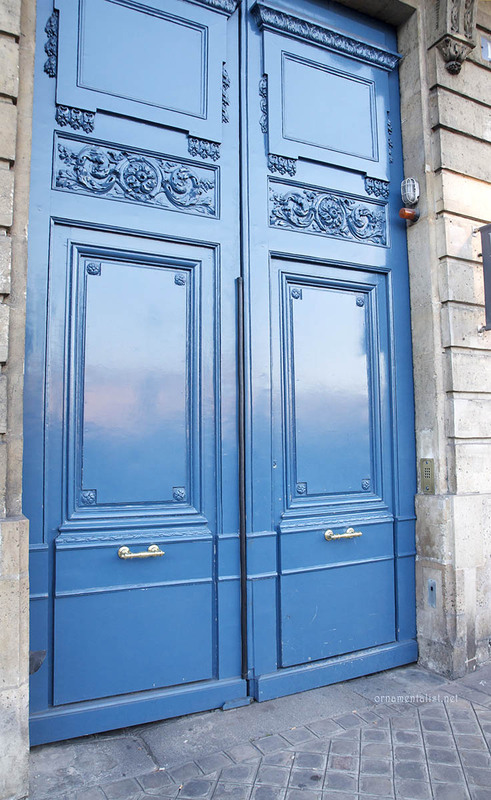 I've always loved the 'everyman' (or woman) quality to what we do: that every door in every apartment building in Paris is faux-painted speaks to the fact that this craft can be learned by anyone. I love that. Like being in Indonesia and seeing whole villages of people doing the most intricate ornate wood-carving. I agree about the doors of Holland too. Could I add the doors of Georgian Dublin to that list? Brightly painted in high gloss that perfectly offsets the color of the stone. Lynne, I always photograph doors too. Usually I tell myself that they'll come in useful someday in a trompe l'oeil mural, but I know the truth is that I'm just one of those weird individuals with a thing for doors. When I walk away with a good secretive snap I have the dirty feeling like I've gotten away with something. Okay, maybe that's just me. Okay now we are exposing the weirdos who travel and collect door photos. I think for me it's a thing because I live in a city where the doors are not at street level, (and the streets are not level either!) and so the doors here tend to be harder to notice. but I DO show these pictures to clients who want to paint their doors, to encourage them not to worry about whether it "matches" anything else. It's the front door! It's supposed to be special. Laduree's exteriors closely match the color of their packaging and logo; I think they worked hard to come up with that color and have it associated with them. the Versailles blue is the very best- I love it. Beautiful photo’s I love the doors of Paris. St Germain was the first neighborhood of Paris I stayed in the first time I visited the city over 15 years ago.